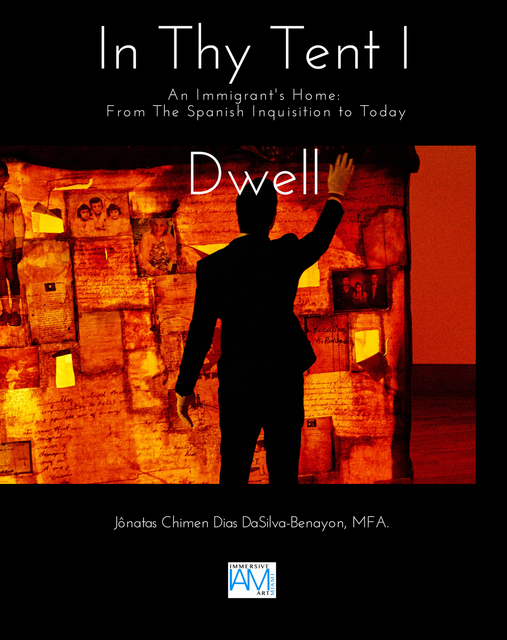 Discover artist Jonatas Chimen's most introspective art piece and personal writing: In Thy Tent I Dwell, first featured in 2016 at The Patricia and Phillip Frost Art Museum in Miami, is a masterpiece which retells the stories of immigration, adaptation, forced conversions, and hybridization of the artist's family through their 500-year Diaspora. Foregoing a linear narrative, Chimen has produced a multi-sensory experience of nostalgia by painting, threading, writing, and appliqueing on photographs, birth certificates, inquisitional archives, and immigration documents, in a large-scale museum-quality installation. Through the metaphor of the tent, Jonatas speaks of the universal immigrant experience of wandering through time and space, as well as of the isolation and secret religious practices which his family was forced to adopt as far back as the Spanish Inquisition in the fifteenth century. Embedded in his art is history, emotion, spirituality and personal passion. Brazilian-American artist (b. 1981, Brasilia), Jônatas Chimen Dias DaSilva-Benayon, or simply 'Jonatas', is a Symbolist artist whose influences stem from Sequential Art, Baroque, and Modernism. His classical use of archetypes follow the lines of psychiatrist Carl Gustav Jung, and mythologist Joseph Campbell. Bold figures and carefully chosen subjects situated against contrasting backgrounds appear to glow and rise from the canvas. His message of embracing one’s cultural identity and disclosing personal beliefs with pride is a recurring theme in his work. Though elegantly quiet, Jonatas' message always speaks his mantra—live your life, be who you are.